Closeup of a touchpad on an Acer CB5-311 laptop. A touchpad or trackpad is a pointing device featuring a tactile sensor, a specialized surface that can translate the motion and position of a user's fingers to a relative position on the operating system that is made output to the screen. Touchpads are a common feature of laptop computers, and are also used as a substitute for a mouse where desk space is scarce. Because they vary in size, they can also be found on personal digital assistants (PDAs) and some portable media players. Wireless touchpads are also available as detached accessories. Touchpads operate in one of several ways, including capacitive sensing and resistive touchscreen. The most common technology used in the 2010s senses the change of capacitance where a finger touches the pad. Capacitance-based touchpads will not sense the tip of a pencil or other similar ungrounded or non-conducting implement. Fingers insulated by a glove may also be problematic. While touchpads, like touchscreens, are able to sense absolute position, resolution is limited by their size. For common use as a pointer device, the dragging motion of a finger is translated into a finer, relative motion of the cursor on the output to the display on the operating system, analogous to the handling of a mouse that is lifted and put back on a surface. Hardware buttons equivalent to a standard mouse's left and right buttons are positioned adjacent to the touchpad. Some touchpads and associated device driver software may interpret tapping the pad as a mouse click, and a tap followed by a continuous pointing motion (a "click-and-a-half") can indicate dragging. Tactile touchpads allow for clicking and dragging by incorporating button functionality into the surface of the touchpad itself. To select, one presses down on the touchpad instead of a physical button. To drag, instead of performing the "click-and-a-half" technique, the user presses down while on the object, drags without releasing pressure, and lets go when done. Touchpad drivers can also allow the use of multiple fingers to emulate the other mouse buttons (commonly two-finger tapping for the center button). Touchpads are called clickpads if it does not have physical buttons, but instead relies on "software buttons". Physically the whole clickpad formed a button, logically the driver interpret a click as left or right button click depending of the placement of fingers. Some touchpads have "hotspots", locations on the touchpad used for functionality beyond a mouse. For example, on certain touchpads, moving the finger along an edge of the touch pad will act as a scroll wheel, controlling the scrollbar and scrolling the window that has the focus, vertically or horizontally. Many touchpads use two-finger dragging for scrolling. Also, some touchpad drivers support tap zones, regions where a tap will execute a function, for example, pausing a media player or launching an application. All of these functions are implemented in the touchpad device driver software, and can be disabled. By 1982, Apollo desktop computers were equipped with a touchpad on the right side of the keyboard. Introduced a year later, the Gavilan SC included a touchpad above its keyboard. A touchpad was first developed for Psion's MC 200/400/600/WORD Series in 1989. Olivetti and Triumph-Adler introduced the first laptops with touchpad in 1992.Cirque introduced the first widely available touchpad, branded as GlidePoint, in 1994. Apple Inc introduced touchpads to the modern laptop in the PowerBook series in 1994, using Cirque's GlidePoint technology; later PowerBooks and MacBooks would use Apple-developed trackpads. Another early adopter of the GlidePoint pointing device was Sharp. Later, Synaptics introduced their touchpad into the marketplace, branded the TouchPad. Epson was an early adopter of this product. A touchpad on an early-2000s-era Sony Vaio laptop, an early example of a modern laptop touchpad. As touchpads began to be introduced in laptops in the 1990s, there was often confusion as to what the product should be called. No consistent term was used, and references varied, such as: glidepoint, touch sensitive input device, touchpad, trackpad, and pointing device. Users were often presented the option to purchase a pointing stick, touchpad, or trackball. Combinations of the devices were common, though touchpads and trackballs were rarely included together. Since the early 2000s, touchpads have become the dominant laptop pointing device as most laptops produced during this period beyond include only touchpads, displacing the pointing stick. Trackpad of the BlackBerry Curve 8520 in the red circle. 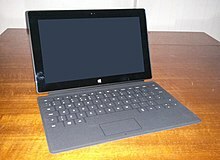 A Microsoft Surface tablet. The touchpad is the rectangle near the bottom of the gray keyboard. Touchpads are primarily used in self-contained portable laptop computers and do not require a flat surface near the machine. The touchpad is close to the keyboard, and only very short finger movements are required to move the cursor across the display screen; while advantageous, this also makes it possible for a user's palm or wrist to move the mouse cursor accidentally while typing. Touchpads also exist for desktop computers as an external peripheral, albeit rarely seen. Touchpads are sometimes integrated in some desktop computer keyboards, particularly keyboards oriented for HTPC use. One-dimensional touchpads are the primary control interface for menu navigation on second-generation and later iPod Classic portable music players, where they are referred to as "click wheels", since they only sense motion along one axis, which is wrapped around like a wheel. Creative Labs also uses a touchpad for their Zen line of MP3 players, beginning with the Zen Touch. The second-generation Microsoft Zune product line (the Zune 80/120 and Zune 4/8) uses touch for the Zune Pad. Apple's PowerBook 500 series was its first laptop to carry such a device, which Apple refers to as a "trackpad". When introduced in May 1994, it replaced the trackball of previous PowerBook models. In late 2008 Apple's revisions of the MacBook and MacBook Pro incorporated a "Tactile Touchpad" design with button functionality incorporated into the tracking surface. Beginning in the second generation of MacBook Pro, the entire touchpad surface acts as a clickable button. Laptops today feature multitouch touchpads that can sense in some cases up to five fingers simultaneously, providing more options for input, such as the ability to bring up the context menu by tapping two fingers, dragging two fingers for scrolling, or gestures for zoom in/out or rotate. Psion's MC 200/400/600/WORD Series, introduced in 1989, came with a new mouse-replacing input device similar to a touchpad, although more closely resembling a graphics tablet, as the cursor was positioned by clicking on a specific point on the pad, instead of moving it in the direction of a stroke. There are two principal means by which touchpads work. In the matrix approach, a series of conductors are arranged in an array of parallel lines in two layers, separated by an insulator and crossing each other at right angles to form a grid. A high frequency signal is applied sequentially between pairs in this two-dimensional grid array. The current that passes between the nodes is proportional to the capacitance. When a virtual ground, such as a finger, is placed over one of the intersections between the conductive layer some of the electrical field is shunted to this ground point, resulting in a change in the apparent capacitance at that location. This method received U.S. Patent 5,305,017 awarded to George Gerpheide in April 1994. The capacitive shunt method, described in an application note by Analog Devices (not to be confused with analog devices), senses the change in capacitance between a transmitter and receiver that are on opposite sides of the sensor. The transmitter creates an electric field which oscillates at 200–300 kHz. If a ground point, such as the finger, is placed between the transmitter and receiver, some of the field lines are shunted away, decreasing the apparent capacitance. Wikimedia Commons has media related to Touchpads. ^ "Tap and drag". Apple.com. ^ a b "The Tactile Touchpad". sigchi.com. ^ a b "A Comparison of Three Selection Techniques for Touchpads" (PDF). yorku.ca. ^ "Libinput documentation, Clickpad software button behavior". wayland.freedesktop.org. ^ a b "GUIdebook Psion MC Series brochure". guidebookgallery.org. ^ a b c Diehl, Stanford; Lennon, Anthony J.; McDonough, John (Oct 1995). "Touchpads to Navigate By". Byte. No. October 1995. Green Publishing. p. 150. ISSN 0360-5280. ^ "A WinBook for the Fussy". Windows Magazine. No. Dec 95. 1995. p. 105. ^ "Sharp Unveils Line of Notebooks". Westchester County Business Journal. Westchester County Business Journal (November 20, 1995). 1995. ^ Malloy, Rich; Crabb, Don (October 1995). "Power Packed Power Books". Mobile Office. New York, NY (October 1995): 44–52. ^ Jerome, Marty (1995). "Lightweight, Low-Cost Challenger". PC Computing. PC Computing (December 1995): 96. ^ "Blackbird: The PowerBook 500 Series". Low End Mac. 1994-05-16. Retrieved 2017-07-09. ^ Ackerman, Dan (June 10, 2009). "Apple MacBook Pro Summer 2009 (Core 2 Duo 2.26 GHz, 2GB RAM, 160GB HDD, Nvidia GeForce 9400M, 13-inch)". CNET. Retrieved April 11, 2010. ^ "GUIdebook Psion MC Series brochure, page 4". guidebookgallery.org. ^ "Analog Devices' Capacitive Shunt Method" (PDF). analog.com. Look up touchpad or trackpad in Wiktionary, the free dictionary.